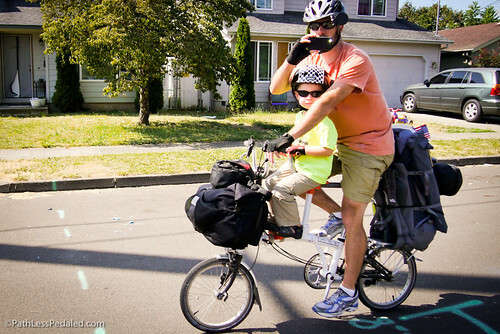 Home > Route > Bike Camping with Kidical Mass PDX! 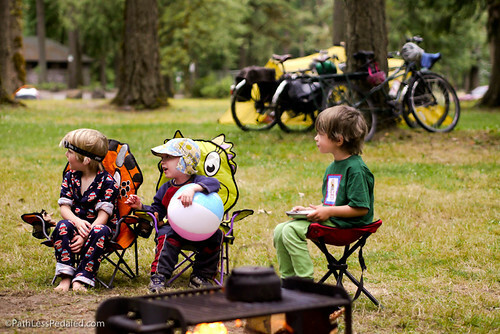 This weekend we shook up our bike touring adventures with something new, bike camping with KidicalMassPDX! Andy, one of the organizers for the bike camping trip invited us along to join in the fun. 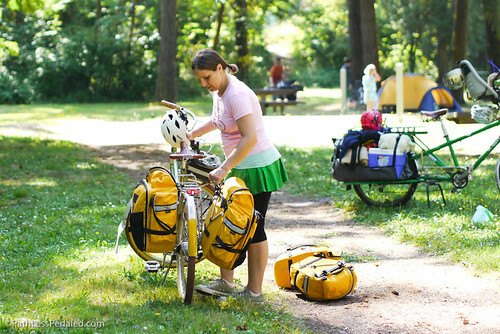 Though Laura and I don’t have any kids of our own, we are very supportive of family biking and especially bike camping! 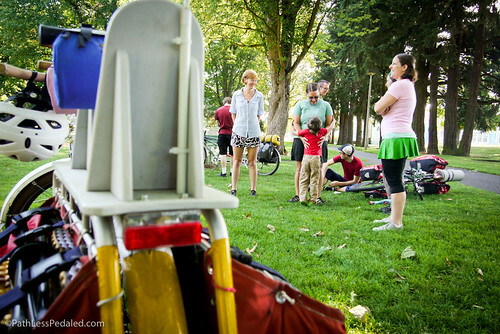 We met at Woodstock Park in SE Portland which appropriately had a playground at the start. In total there was about a dozen families, 22 bikes and 16 kids in attendance! 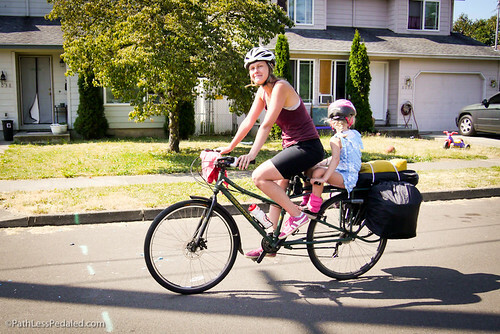 The bikes ran the gamut from regular bikes with trailers, to a Surly Big Dummy, a Kona Ute, a custom Bilenky longtail, a Bilenky coupled tandem and even a pair of Bromptons specially outfitted with a child’s seat. It was quite the sight to behold! Sometimes its easy to take all this bikey fun for granted living in Portland, but we definitely recognized how special this event was. Our end destination was Dodge Park (GPS route), formerly a day use only site along the confluence of the Sandy and Bull Run river that has been recently re-opened to camping. The distance from the meeting point to the campground was about 22 miles, far longer than the usual KidicalMass rides. About half the ride was on off-road paths a significant portion would be on small country roads. 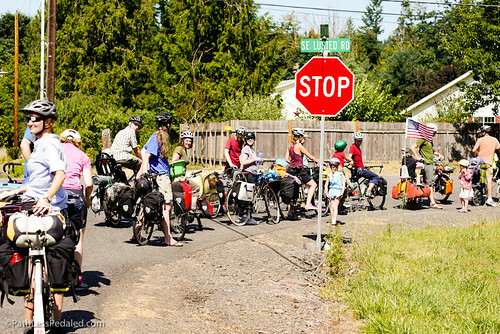 This sort of riding is usually beyond the ken of Kidical Mass, but the route was well chosen and generally managed to avoid busy roads and steep hills. Another great feature about the route was that it was essentially a door-to-door route without the need to take any transit. 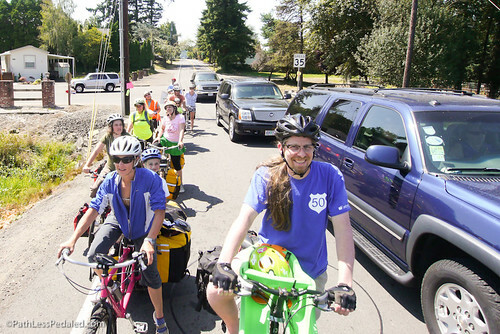 This has been a big deterrence for many would-be family bike campers with cargo bikes who can’t easily take light rail past the suburbs of Portland. As enlightened as Portland can be with some things transit oriented, the MAX rail system isn’t really all that great with bikes. If you have a regular bike you have to lift it up and put it on a hook and there is a general ban on trailers, tandems and cargo bikes. This route, however, cut all that needless worry and hassle of negotiating with grumpy passengers and Trimet operators. 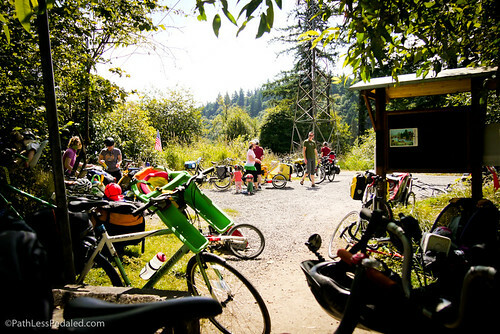 A large part of the first 10 miles was on the Springwater Trail which made for relaxed riding and getting to meet some of the families. Filtering back and forth and taking photos, I learned that for quite a few of the families it was their first ever bike camping trip with kids. What made it appealing to newbie families was being part of a great supportive group of other families and of course, new playmates. 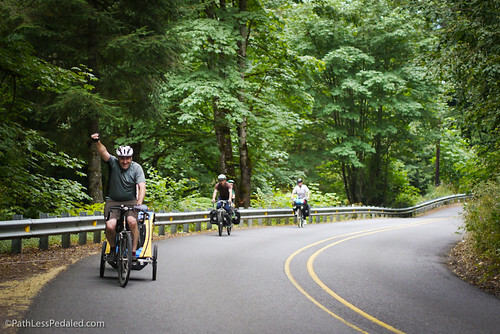 The ride pace was family friendly with plenty of restroom breaks and even a berry picking break along the Springwater. 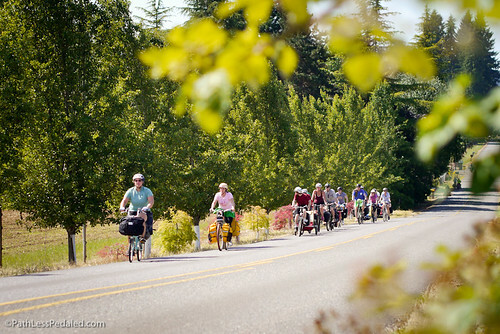 Once we left the Springwater, there were some small roads with light to moderate traffic to negotiate but it was largely just a pleasant ride through the Oregon countryside. 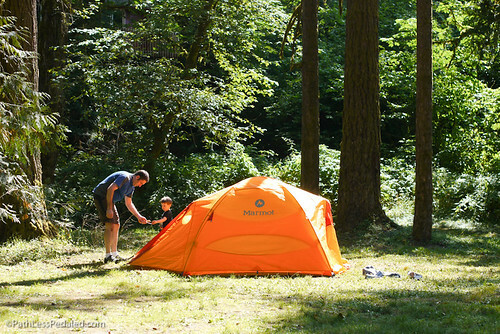 After a gradual climb you descend down to river level beneath a canopy of trees and essentially coast to the campground. The campground itself was nice with lots of trees providing shade. There was a new-ish looking covered pavilion building with bathrooms, showers and a small outdoor amphitheater. A short walk from where we pitched our tents were the Sandy and Bull Run rivers with quite a few beach areas for swimming. At this point, Laura and I snuck away momentarily from the group so I could get a little fishing in. 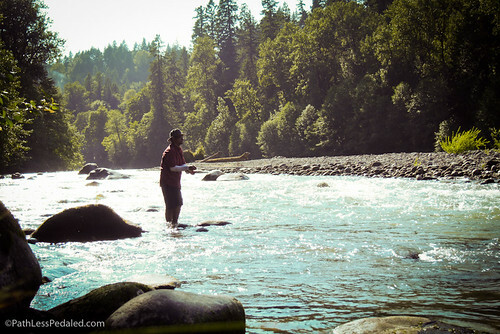 On the first cast I hooked an aggressive small trout that eventually got off. I managed to hook and land another small one about twenty minutes later. No record breakers, but it was good fun to feel the tug of a fish on the line. 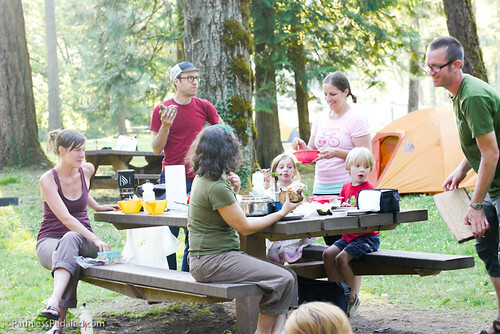 By the time we got back to camp, a fire was built and dinner was in full tilt. We enjoyed chatting and meeting some new people and slowly the kids pealed away and went to bed. Some “grownups” stayed up a wee bit later and talked until it got dark. The next morning, we all prepared breakfast and lingered a bit. There was a scheduled break for the kids to head down to the river before pedaling off. After everyone was packed up and on their bikes I took a group photo and we pushed off to tackle “the hill.” The nice long descent at the end of the day yesterday was to be the first climb this morning. It was a little slow going, but with some patience and sweat everyone made it up to the regrouping spot at the top of the hill. It was there that we peeled off and said our goodbyes to the rest of the group. 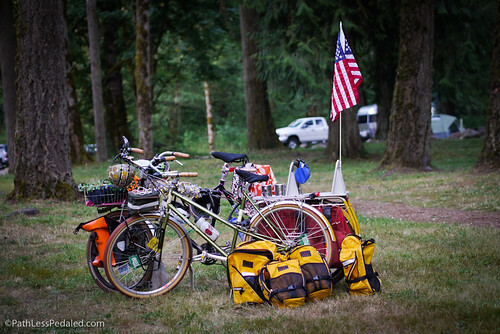 It was a fun weekend and it was great to share the experience with some families new to bike camping. After the success of this trip, I have a feeling it won’t be the last trip KidicalMassPDX will organize! I’m really looking forward to exploring Dodge Park! Can you compare The Hill to another slope in Portland? The Oxbow hill, for instance, is ridiculous. Is the Dodge Park hill more like Mt. Tabor or Greeley or Alameda, etc.? WAY easier than Oxbow. Easier than the mid-section of Tabor. Maybe about as steep as the last part of Tabor after the upper gate? The GPS route is not opening for me, do you have a GPX file that could be obtained? Nice one, everyone! Looks like it was fun. Kudos to Andy S, who put the route together. gl, you should totally check out Dodge Park! But be advised, it is only open during “summer”, ie Memorial Day to Labor Day. So you got another month to go. Russ, I understand that the MAX could be better for non-standard bikes. 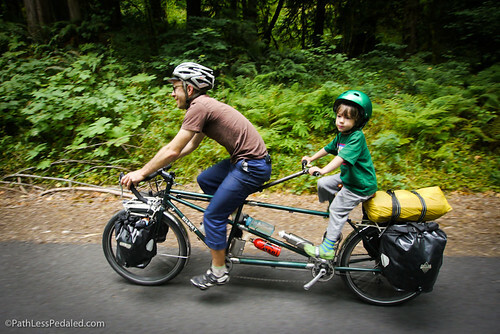 But in your travels, have you encountered any North American rail system (light or heavy rail) that was accommodating to cargo bikes, trailers, tandems, etc? @Adventure! Yes! Strangely enough, the light rail in Los Angeles is actually pretty good with cargo bikes! On the Red Line – all they did was take out a few rows of seats (about the length of a bike and a half) and have a colored rectangle on the ground. You simply push the bike on and lean it against the wall. The space is big enough to accommodate a longtail, bike with trailer and maybe even a bakfiets (I know it fit the Bilenky no problem). Beautiful description and pictures like always. I got to meet you at the start of this ride for a brief second, while I was touring down to the coast. Thanks for the suggestion to Nestucca Rivier Road. Beautiful ride. 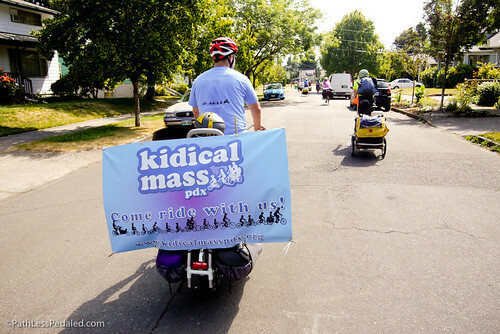 Heres more pictures of that particular Kidical Mass event. and here are pictures of us going through Nestucca River Road and ultimately through the Nestucca River with our bikes.